If you like the first "Thor" Disney movie, you'll adore its successor "Thor 2: The Dark World", which is a sound combination of fantasy, sci-fi, superhero action and some suggestive content. Plus, the cast in the previous "Thor" all come back again in fine form to deliver the audience this humorous blackbuster with decent 3D effect. Thor 2: The Dark World tops its domestic box office at the first release weekend and gains up to 86 million dollars from the States. Only three days from Nov.8 to Nov. 11, 2013, it should receive as high as 327 million dollars unbelievable box office around the world. No wonder that large numbers of movie buffs are going gaga over this most-awaited flick and can't wait to preorder its DVD version on Amazon. Provided that you also order its DVD and are eager to backup DVD Disney movie Thor 2: The Dark World to your storage devices against it being lost or physically scratched, you need to seek for a DVD ripper to help you to rip and copy DVD Thor 2: The Dark World to your storage devices. However, Disney movie Thor 2: The Dark World, produced by Disney Walt Pictures, is encrypted by the latest Disney X-project protection with no doubt. Thus, most common used DVD rippers like Handbrake are willing to but powerless to render assistance to you. Fortunately, here comes an edge-cutting DVD ripper-MacX DVD Ripper Pro able to do you a big favor. MacX DVD Ripper Pro, inherent with the advanced technology, is capable of removing the latest Disney X-project protection, let alone parrying the general encrypted protection like CSS, Sony ARccOS and all 1-6 region codes. In addition, it can convert Disney movie Thor 2 DVD to MP4, MOV, DVD to AVI, FLV, etc. for forever keep on Mac computer or USB devices and more on Mac. Better still, This DVD ripper for Mac also allows you to back up DVD Disney Movie Thor 2: The Dark World with a single MPEG2 file in original video quality and 5.1 channels Dolby AC3/DTS audio preserved. To amaze you, it features copying Disney Movie Thor 2: The Dark World DVD to ISO Image and backing up Thor 2 DVD to MKV on Mac. It supplies multiple choices for you to freely copy DVD Thor 2: The Dark World on Mac. MacX DVD Ripper Pro, inherent with the advanced technology, is capable of removing the latest Disney X-project protection, let alone parrying the general encrypted protection like CSS, Sony ARccOS and all 1-6 region codes. In addition, it can rip and copy Disney movie Thor 2 DVD to MP4, MOV, DVD to AVI, FLV, MPEG, WebM, MKV, WMV, etc. for forever keep on Mac computer or USB devices and more on Mac. Better still, This DVD ripper for Mac also allows you to back up DVD Disney Movie Thor 2: The Dark World with a single MPEG2 file in original video quality and 5.1 channels Dolby AC3/DTS audio preserved. To amaze you, it features copying Disney Movie Thor 2: The Dark World DVD to ISO Image and backing up Thor 2 DVD to MKV on Mac. It supplies multiple choices for you to freely convert DVD Thor 2: The Dark World on Mac. With the straightforward interface, no matter you are a newbie or an expert, you can easily savvy it and give it just four clicks. Then it will automatically back up Disney movie Thor 2: The Dark World DVD on Mac. Step 1: Download MacX DVD Ripper Pro and run it on Mac. Then import DVD Disney Movie Thor 2: The Dark World by hitting "DVD Disc" button. Step 2: Choose the output format. This DVD ripper for Mac provides you with four copy modes above to choose from the pop-up window. Step 3: Click "Browse" button to save your ripped DVD film. Step 4: Click "RUN" to start digitalizing DVD Thor 2: The Dark World on Mac computer. Notes: Beyond copying Disney Movie Thor 2: The Dark World DVD on Mac, this DVD ripper program can also empower you to play back Thor 2: The Dark World DVD on any mobile or tablet such as DVD to iPhone 5S/5C, iPhone XS/XR/X/8/7/6S/6, iPad Air/mini/Pro, DVD to Samsung Galaxy S4/S6/S7/S8/S9, HTC One, etc by simply ripping DVD to the specific device you want in a fraction of minis. Have a headache in ripping and copying protected DVD on Mac OS? 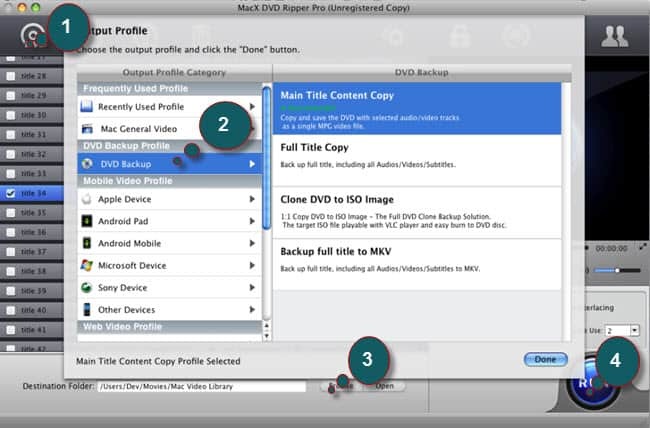 MacX DVD Ripper Pro assists you to rip protected DVD even protected by Disney X-project protection on Mac easily. Copy DVD to DVD for Mac in a few clicks.